After an impressive innaugural art car at EDC Vegas for Monstercat in 2017 which featured a wild set from Kayzo, the Canadian label returns to the Las Vegas Motor Speedway in 2018 with a jam-packed lineup on the Kalliope Car on Saturday May 19th that aims to supersede the previous year's lineup. 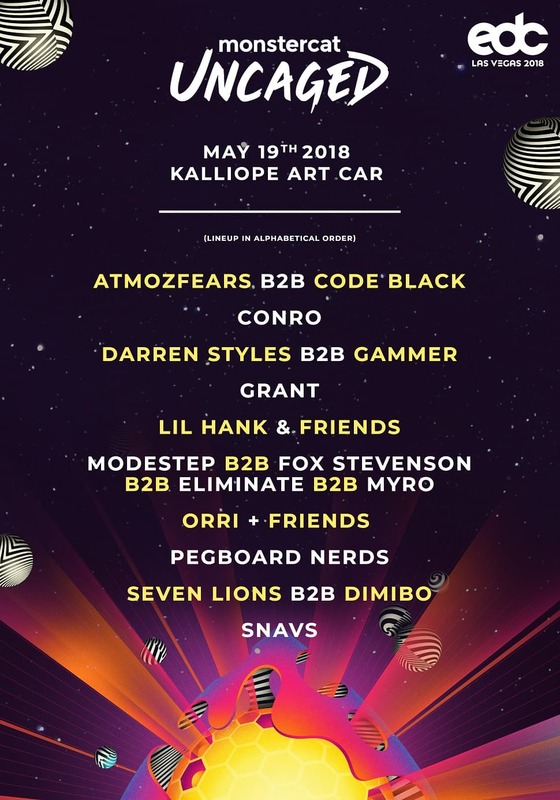 Featuring the likes of Grant, Pegboard Nerds, Snavs, Seven Lions b2b Dimibo, a massive set from Modestep b2b Fox Stevenson b2b Eliminate b2b Myro; a set from the mystery moniker lil hank & friends; Atmozfears b2b Code Black; a set from chart topping artist Conro; and Darren Styles b2b Gammer to close out the night, it should be quite the spectacle to witness under the electric sky. For those heading to Sin City next weekend, it will certainly be a must see show. Monstercat is one of electronic music’s most influential independent record labels. Founders Mike Darlington (CEO) and Ari Paunonen (CSO) established the label in 2011, and since moving to Vancouver, British Columbia, have built a roster of world-renowned artists. The company’s mission is to connect artists with fans in a way that nurtures the spirit of sharing and family.